Let's Do Lunch! Today's offer: Double Pretty Points 5 hours only! From noon to 5PM (ET) today, we're doubling your points for double the rewards! - For every $1 you spend, you'll earn 10 points (instead of 5); hit 500 points and we'll add a $10 rewards certificate to your account - Bonus deluxe sample with every order Offer begins 10/4/2011 at noon (ET) and ends 10/4/2011 at 5PM (ET). 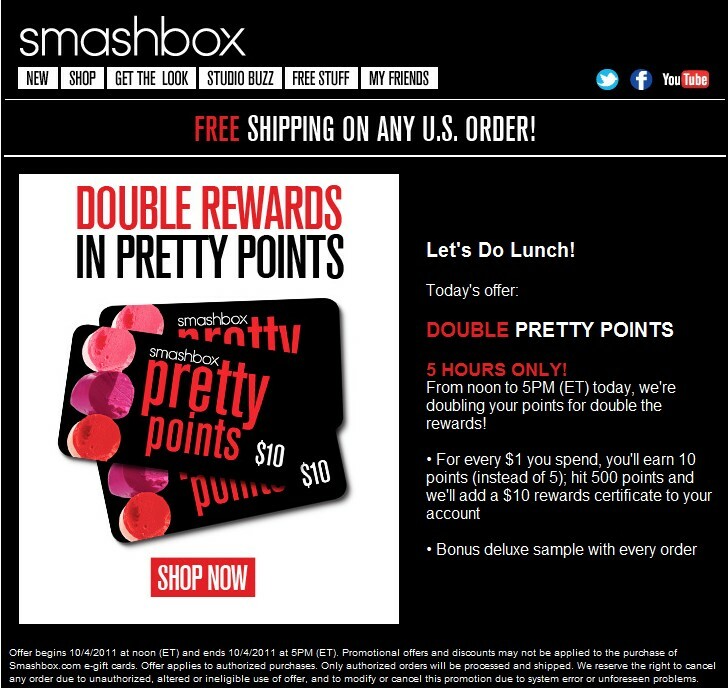 Promotional offers and discounts may not be applied to the purchase of Smashbox.com e-gift cards. Offer applies to authorized purchases. Only authorized orders will be processed and shipped. We reserve the right to cancel any order due to unauthorized, altered or ineligible use of offer, and to modify or cancel this promotion due to system error or unforeseen problems.